because man, this Winter is getting old! I wanted to share a simple DIY for the Dining Room. 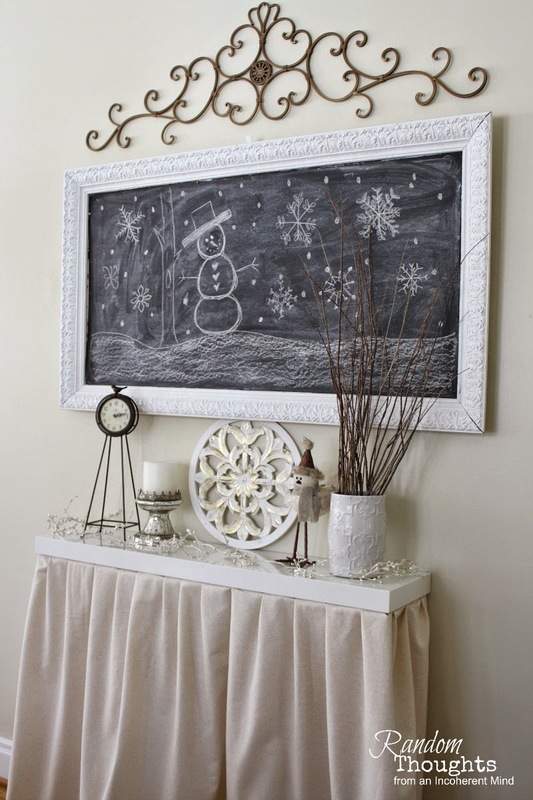 you know I often share my dining room chalkboard with you. you may or may not have noticed it yourself. with nothing to ground it. but my husband was always against it. of space with something, blah, blah, blah. 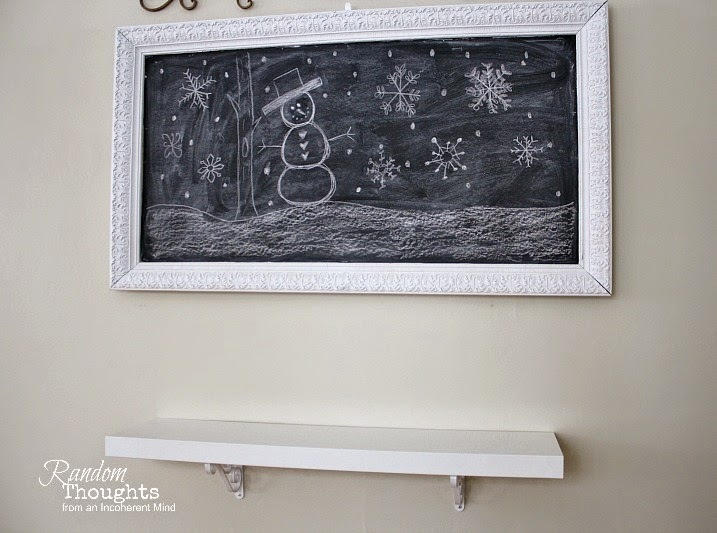 and the chalkboard no longer floats! then I MUST refuse to see Winter inside as well. Spring decorating here I come!!! Looks nice, and it looks like it takes up very little floor space. 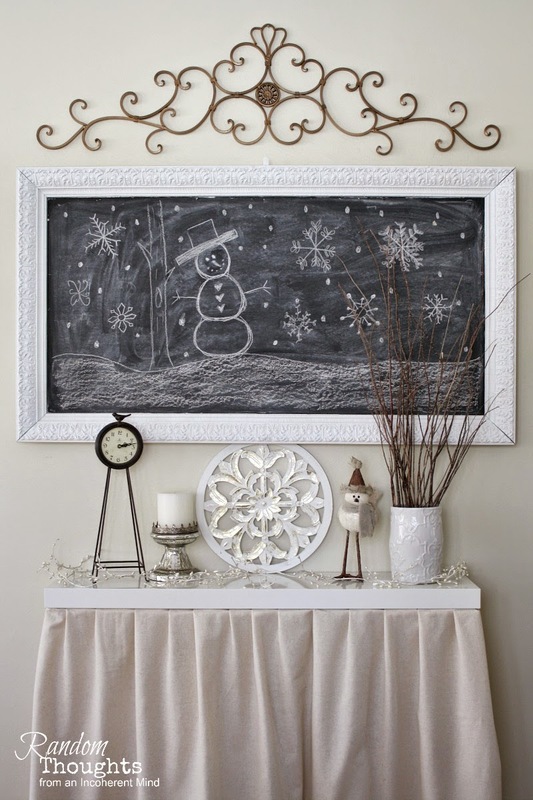 I read recently, that chalkboards are not longer popular... well, they are with me, and I love your!! Oh my gosh, I would never have thought of that. Look how cute that is. I love it. How flippin cute is that!!!!! You are just to clever. That is so adorable!!! Good idea....what do men know anyhow!!! What a great idea ! You rocked this idea! Love it my friend ! What a clever solution to your problem, Gina. The whole area just looks so great. I'll bet you've already starts on that Spring decor! Great idea! It looks pretty and gives you a fun spot to work with. When you asked what to do I was going to say "find another husband" ahahahah (he can email with his deepest thanks later because I didn't ;))... AND... I happen to agree with him. Your home has a magical energy because each piece is just right, in the right place and somehow outstanding because it isn't crowded by 10000 pieces - big and small - nearby. I always love it because it looks "complete" without that "oh my, did you got all this from your Aunt Maud today?" (;) if you know what I mean). I like the shelf, and even feng-shui (you can use this with dear hubby on a later occasion) says that for good energy, things shouldn't look out of place or "just" hanging. And shelves, small and tasteful (like yours!) are welcome. With the skirt it looks a very feminine wink to the husband, a kind of "didn't I tell you something was missing here?" wink. And everything, once again, is so perfect and harmonious. Oh, Spring is coming. I need to catch up the fever. This and that always make us happy, doesn't it!? Hopefully your snow will melt soon and the grass will peek out. Hi Gina! Oh, you are the smartest and most creative one! I love this and that you put a skirt on the shelf! How brilliant! It all looks so nice. I can't believe I'm going to say this but I'm so getting tired of the snow too. Where is all of this stuff going to go when it melts? Hey Gina! Your buffet is so cute. You came up with the perfect solution! Bring on the spring decor! Gina, Very, very cute! I am decorating our new dining room and I get the same comments from my husband. Great solution. Perfect solution. Necessity is the mother of invention you know :-) It looks great my dear friend. Your table/shelf is very cool! Good for you!